Coding does not only have to be what happens on screen! The creation of algorithms and writing of code has been portrayed in the media as something that happens on a screen. While it is true that majority of coding type activities happen on screen, it is important to note that not all have to. 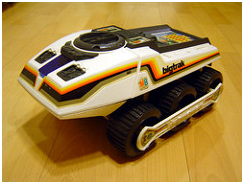 For many years now schools have been using programmable floor toys such as the Valliant Roamer, TTS Bee/Pro Bots, Swallow Pixie and even Big track (the toy that everyone wanted in the 80s!). 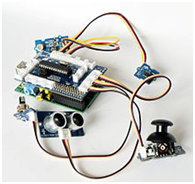 These devices allow children to input and see the results of their algorithms in physical form. 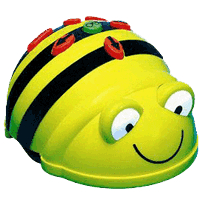 This never fails to create the wow factor in the classroom. 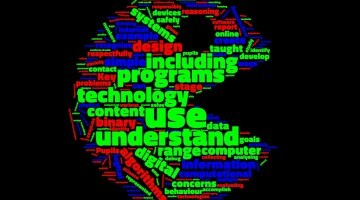 It fits perfectly within the new computing curriculum for Primary Schools. One area of coding I have been interested in more recently is the move away from seeing software such as MIT’s Scratch as the be all and end all of coding lessons. It can become far more powerful when used as the ‘middle man’ to allow input and output devices to talk to each other in ways that are more complex. Think of an input as something that can create an instruction. This could be a switch, light sensor etc. Outputs come in many forms too such as lights, buzzers, motors and the like. Yes, we can create simple electrical circuits to make a light come on when a button is pressed, but what if we could automate it? With a bit of technical knowhow Scratch can be taught to do just that! 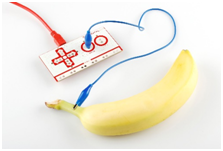 In the simplest form of Physical inputs, Scratch can be tricked into thinking that the inputs from a Makey Makey (short for make anything a key) board. 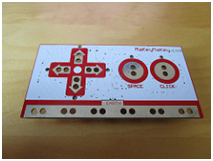 The Makey Makey board works by creating a circuit out of anything you can imagine and mapping it to a keyboard input the computer understands. I have had five children playing Pacman collaboratively. Four becoming the direction buttons and one (the ground) high fives the other players to change direction. 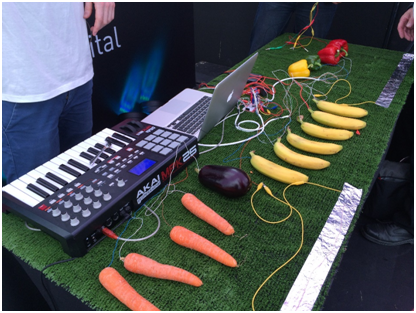 At a recent “Make it Digital” festival hosted by a National Broadcaster, I was impressed to see two musicians using this technology to trigger musical loops by touching fruit and vegetables. In essence, each time they touched a piece of fruit it completed a circuit. Scratch interpreted this as a key press and an algorithm triggered a sound loop. 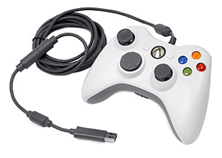 Kodu a visual programming environment by Microsoft allows an Xbox controller to be connected to it so that children can use the controller as an input for their own games! 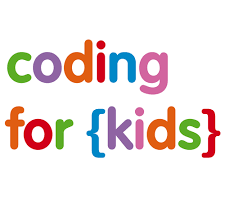 Straight away this provides a very powerful hook for the children’s interest and gives them a clear idea where coding has importance in their lives. Scratch can trigger sounds on the computer, but can attach to external devices (especially on the Raspberry Pi) to control external LED arrays, motors, speakers. The possibilities this brings are endless. 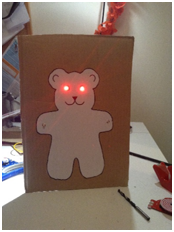 Children could program their own simple robots, or even create traffic light simulations. This is not the easiest thing to do unless you have specific knowledge of the Linux operating system that the Raspberry Pi uses. However, panic not! Some manufacturers have realised this and are coming to the market with much simpler all in one board solutions. Redfern Electronics have created a board called a crumble that allows you to do all of the above via a board less than 10 cm and costs less than £20. It uses a very similar environment to Scratch, and can be used to control external devices. 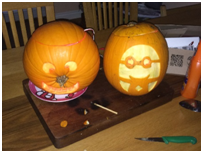 The most inventive use I have seen so far for this was to create an algorithm to make flashing lights on a Halloween pumpkin (project by Colin Grimes @MrGPrimary). There are a number of other boards either on the market already or coming soon which can achieve very similar. 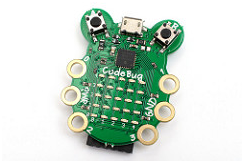 The code bug works in a similar way to the crumble controller. The BBC Microbit is arriving in schools (free of charge), but is limited to pupils in Year 7 currently. The final innovation I think is particularly exciting is an iPad app called Tickle. It uses a form of Scratch so is instantly recognisable to anyone who is learning or who has experienced it. 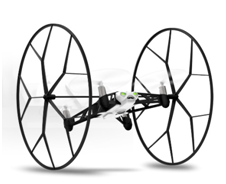 What I love about this free app is that it is set up to work with lots of commercial remote control toys including the Sphero (Bluetooth sphere which can be driven around the room) and Parrot Drones (Flying cameras). The native apps for these toys allow you to drive them in real time, but Tickle allows you to create preprogrammed algorithms. This is almost full circle to the Roamers and bee bots, but in a much cooler way, with the algorithms being viewed on screen, lending itself to easy debugging and improvement. Hopefully I have busted the myth of coding as the preserve of computers and screens exclusively. After all coding has to have a real life application. It is all around us in our toasters, mobile phones and anything that requires instructions other than on/off. Why then, not get children to embrace this, break out of the black box on the desk, and use their coding to make something ‘real’ happen?